Huawei has been on an upward trajectory for years, but 2018 has been somewhat less successful than Huawei would have liked. After being effectively shut out of the US smartphone market, it launched the Mate 10 Pro as an unlocked device. Now, it’s time for Huawei’s second flagship launch of the year, and this one probably isn’t coming to the US even in an unlocked capacity. The new Huawei P20 Pro has a lot in common with the Mate 10 Pro, but there are several notable upgrades—or downgrades, depending on your perspective. This phone is powered by the Kirin 970 SoC with its fancy AI processing core, and the other specs are similarly impressive. Around back, the P20 Pro sports a trio of cameras, each with a different use. 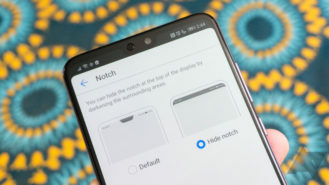 That’s a first for Huawei, as is the screen notch on the front. This design is inconsistent—in some ways it’s beautiful, and in others it’s awkward. Even if the P20 Pro does improve on the Mate 10 Pro in a few ways, the older phone has a pleasing design and lower price tag. 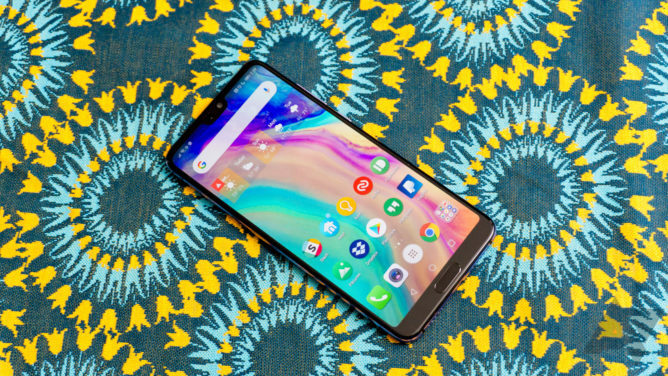 Having used the P20 Pro for about two weeks, I’m still utterly unconvinced by the design. Some things about this phone really blow me away, but other aspects are befuddling. Huawei has shown industrial design chops on par with Samsung in recent years, especially with the Mate 10 Pro and now the P20 Pro. 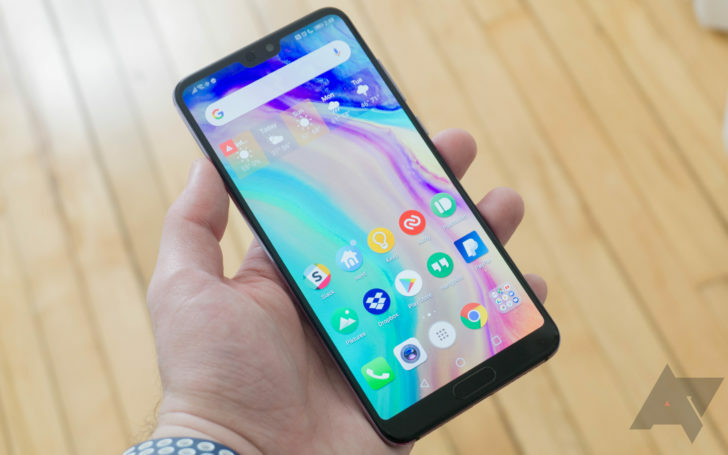 However, it made some honest-to-goodness mistakes when it designed the P20 Pro. Let’s start with the good stuff. The back of this phone is glass, which is very popular right now. There’s no wireless charging, so the glass is just an aesthetic choice. 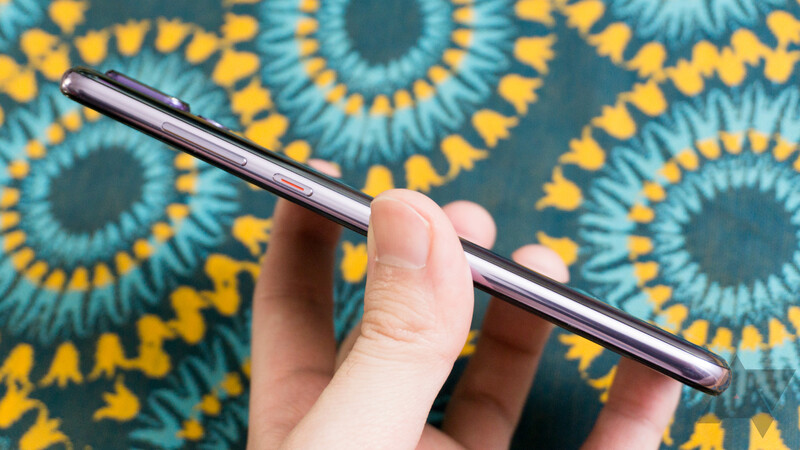 The panel is curved on all four sides like the Mate 10 Pro, wrapping around to meet the polished aluminum band encircling the middle of the device. The main camera module causes a pronounced hump at the top that breaks up the sleekness, though. The glass has a high-gloss finish like HTC’s recent phones. It’s like a mirror, but a very pretty mirror. The version of the phone I’ve been using is the “Twilight” color, which is one of the most gorgeous colorways I’ve seen on a smartphone. It’s purple at the top and shifts to blue at the bottom with an iridescent, shimmery effect. I love bold colors, and this is right up my alley. If you prefer something more understated, the P20 Pro comes in some dull solid colors, too. While I love the color, the P20 Pro’s finish is also incredibly slippery. It’s slid off my desk several times because it wasn’t laying completely flat, and it just slowly migrated until it dropped. There’s no damage from four drops onto a hardwood floor, so bonus points for durability. It’s IP67 rated as well. The phone looks lovely in photos and sitting on my desk/floor, but it gets gross the instant you touch it. Glass phones always pick up fingerprints, but the hyper-gloss finish on the P20 Pro makes them much more apparent. The polished aluminum edge is a lovely pale purple color on my unit, and the other versions have similarly matching rims. On top is an IR blaster, which is pretty wild. Huawei is the only large smartphone maker still doing this. The power and volume buttons are over on the right. They’re tight and have a satisfying click when pressed, and I really dig the orange accent on the power button. On the bottom, you’ve got the lone port, a USB Type-C. Yep, the headphone jack is gone. There’s also a speaker on the bottom, which works with the earpiece to offer stereo sound. The front-facing camera does facial recognition for the P20 Pro, and Huawei is pushing this feature hard. When you pick up the phone, it wakes up and immediately starts looking for a face. Most of the time, face unlock is instant. In waning light, it is not as reliable. At least the fingerprint sensor is the usual lightning-fast experience I’ve come to expect from Huawei. I don’t think any phone has a faster, more accurate fingerprint sensor. 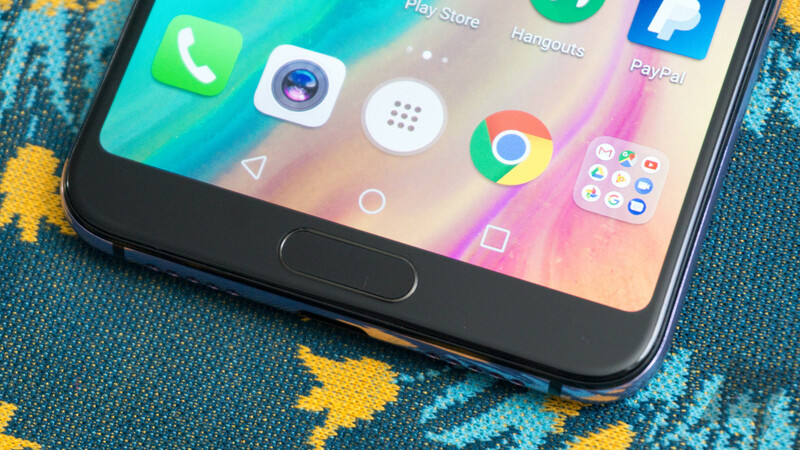 The front of this phone is the most contentious aspect of the design thanks to the notch. That’s up at the top and makes room for the camera, speaker, and notification LED. It’s shaped like the iPhone X notch but much smaller. This allows the display to get near the top edge of the phone. Below the screen is a fingerprint reader, so the phone has a chin that keeps the display from getting to the edge down there. The top half of this phone looks striking at first, even if you’re not a fan of display notches (and I know many of you are not). The bottom, however, is just… lazy. If you’re going to have a notch, you shouldn’t have a chin, too. I know, it’s an engineering challenge that would add to the price, but this half-measure is a waste. 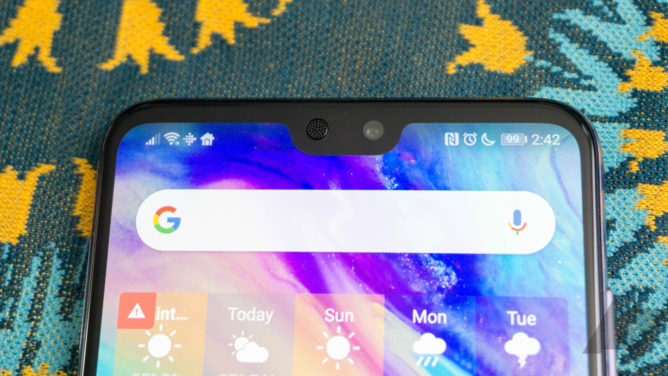 If you’re stuck with the extra bezel at the bottom, why not center the screen and lose the notch entirely? 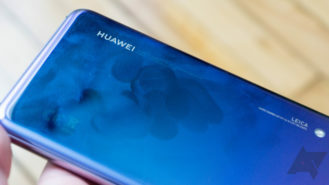 Even if you do like display notches, I don’t think Huawei did the best job with this one. There’s a lot of wasted space around the speaker and camera, and the bezels at the top of the device aren’t even symmetrical. The top bezel is several millimeters larger than the left and right ones, which looks eternally silly once you notice it. The OLED panel itself is a fine specimen with a resolution of 1080 x 2240 pixels. That works out to a slightly unusual 18.7:9 ratio. At 6.1-inches, there’s a bit of fuzziness when you look closely because of the pentile matrix, but this is minor, and most people won’t notice it. 1080p resolution is good enough on a smartphone as long as you don’t intend to use it for VR. Colors are bright and saturated, which seems to be the preference of most smartphone buyers. The default screen mode is vivid, but you can turn on more natural colors if you want. The color temperature is also configurable, and I will note the stock color does look slightly warm to my eye. There’s no off-angle color casting, and brightness is sufficient for outdoor use. There were a few times in very bright light when I had to squint to make things out, but it’s sufficient most of the time. There are a total of four cameras on this phone, which proves the number of cameras is the new megapixel race. Of course, Huawei is also pushing the megapixel count with the P20 Pro. On the back, you’ve got a 40MP RGB sensor, a 20MP monochrome sensor, and an 8MP sensor with 3x optical zoom. Around front is a 24MP selfie camera. It’s almost too much detail for selfies. 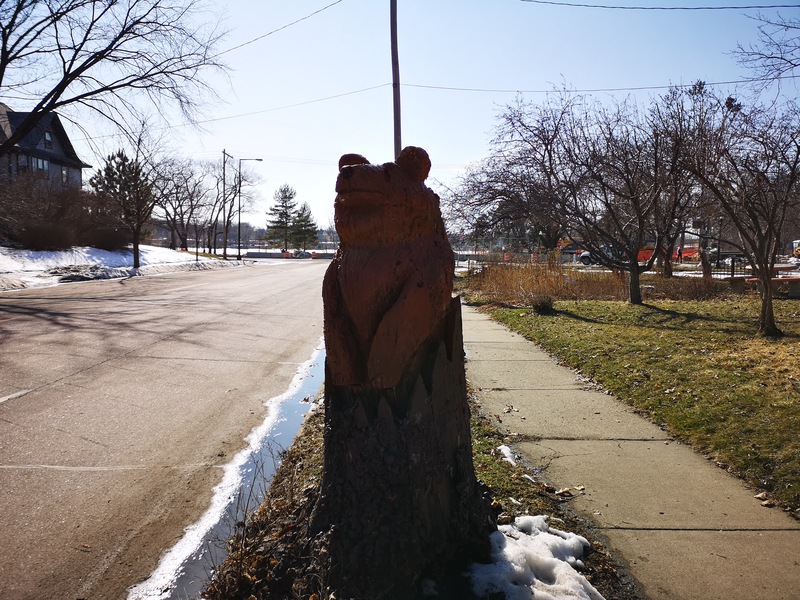 The default shooting mode on the P20 Pro produces 10MP images, and that’s probably where you’ll want to leave it. Huawei uses the Kirin 970’s AI processing core to do a lot of things in the camera like stabilization and scene recognition, and you lose most of that if you crank the resolution up to the full 40MP. You can do that if you insist, but I’d only consider it in very well-lit environments. Even then, the detail isn’t much improved (I have a sample below of the same scene in both modes). With a 40MP sensor, the pixels have to be smaller. That’s not good for collecting light, so Huawei uses pixel binning to treat four pixels as one in the final image. The monochrome sensor data is combined with the RGB data to sharpen the resulting photos (again, this is AI stuff). There are also user-facing Huawei AI camera features. In addition to the background processing and other behind-the-scenes stuff, the camera app recognizes what you’re capturing to apply customized settings immediately. 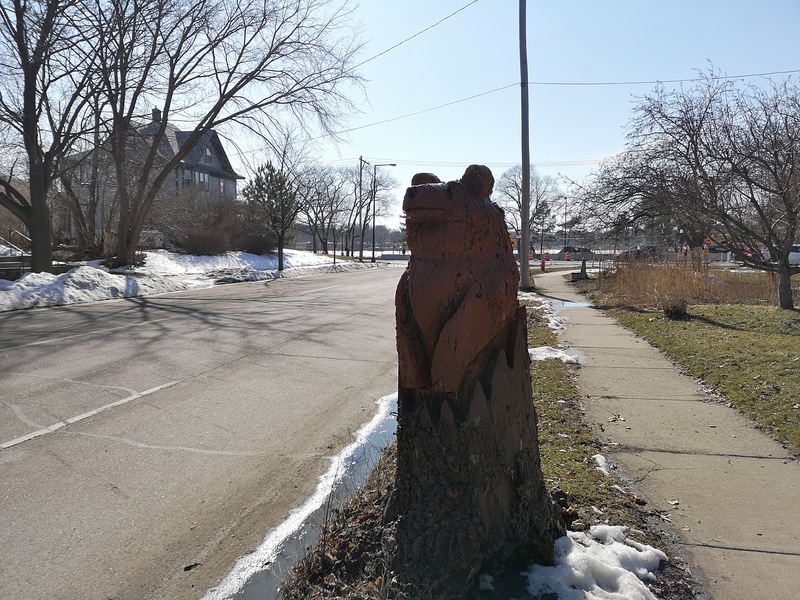 This feature debuted on the Mate 10 Pro last year (there are more scenes this time), and I think it does help sometimes. For example, when taking images of a snowy vista, the camera tweaks exposure and contrast to extract some detail from the bright arctic landscape. Some of the adjustments do tend to make photos look a bit “over-filtered,” but I suspect most people will prefer the punchier colors. I like the option to take 3x zoom shots on this phone—most phones with a zoom camera are only 2x. The P20 Pro also seems to stick with that zoom camera in darker conditions when many phones swap over to a digital crop from the main sensor. I definitely appreciate that. The multiple lenses also help with the P20 Pro’s portrait mode. I don’t notice as many incorrectly recognized borders, and the blur effect is not too heavy-handed. 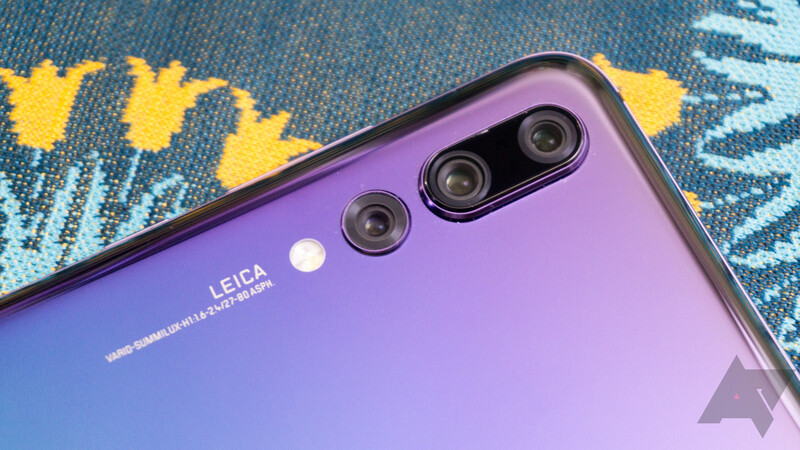 Huawei says just the telephoto camera is optically stabilized, but teardowns suggest all the cameras may be. At any rate, the camera uses AI to handle electronic stabilization, and I haven’t noticed any issues here. In bright outdoor light, the P20 Pro takes excellent photos—it’s up there with the Pixel and Galaxy S9. There’s plenty of detail, colors are accurate, and capture times are quick. My main concern is a lack of automatic HDR processing, which is standard on the Pixel and GS9. That means some photos look blown out in areas, and others are too dim. 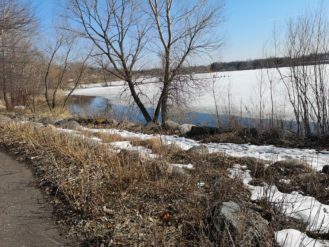 The dynamic range is good for a non-HDR photo in auto mode, but you’re going to miss some shots. There is an HDR mode, but it’s tucked away in the “More” section of the app. It’s a little slow, and I don’t think it makes much difference. See below for a comparison. In medium light, the P20 Pro still captures quickly. However, I’ve noticed a tendency to crush blacks (i.e. losing detail), but white balance is solid. In low light, the auto mode just isn’t as good as a Pixel or GS9, but there is a dedicated night mode in the camera (see the Android figure and street pics in the above gallery). You can take some really amazing shot in this mode, but it’s not ideal for all photos. When you snap a night photo, it actually takes five seconds because the phone captures images at several exposures and mashes them together with AI. The result is a very bright shot, even when taken in a dark room. The downside is you can’t capture anything moving because of the lengthy capture process. The P20 Pro’s camera app has a full professional shooting mode, which lets you adjust the exposure, ISO, white balance, and so on. That’s in addition to all the predefined shooting modes like night, HDR, and portrait. I’m not really in love with the camera app’s UI—it has the same scrolling selector as Apple and Samsung, and it doesn’t change at all when you rotate the phone. Only the icons around the perimeter of the screen rotate, which really gets my OCD going. The AI features are sometimes useful, but they’re not going to push this phone into the same class as the market leaders. Before Huawei can have a shot at taking on the best, it needs to figure out HDR. It should be automatic, not hidden in the settings. Overall, the P20 Pro takes very nice pictures. I don’t think it’s up to the standards of Google, but it’s good enough that you won’t be sorry it’s in your pocket when the time comes to snap some pics. The P20 Pro camera is close in quality to the Galaxy S9+ (and probably better than the non-plus), which has its own issues. The P20 Pro has a lot in common with the Mate 10 Pro in terms of hardware and software. It’s powered by the Kirin 970 and running Android Oreo. However, I should point out I’m running pre-release software on this phone. My experiences might not be 100% what you will experience. Before I get into my battery testing, keep in mind I use my phones for a great deal of email and messaging, but very few phone calls. I streamed music over Bluetooth, snapped photos, and poked around on the internet while testing the P20 Pro. I have three Google accounts syncing to the phone as well. Huawei phones tend to above average battery life in my experience, and that can be said of the P20 Pro. However, it’s not quite as much above average as I had hoped. With moderate use, I got more than two days of battery life with a little over five hours of screen time. I think with heavy usage in a single day, you could hit around seven hours of screen time. However, the standby battery life isn’t as magical as it was on the Mate 10 Pro. Instead of losing 1% overnight, it drops 6-7%. Again, this is pre-release software, and any battery life issues could be fixed in the final device. 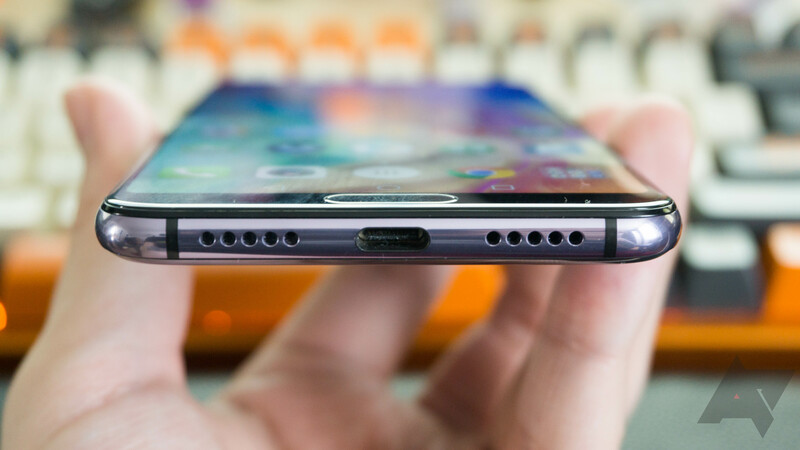 The P20 Pro has Huawei’s Super Charge standard via the included plug, but it will fast charge on USB-PD plugs as well. I have almost nothing negative to say about the performance of this phone. The Mate 10 Pro was already a very fast device with this same (or very similar) hardware, but I think Huawei has successfully smoothed things out, so animations aren’t quite as prone to drop frames—switching apps and scrolling around the UI is smooth. There is one spot where the Mate 10 Pro exhibited unusual lag, and it’s exactly the same on the P20 Pro. When you swipe over from the home screen to the Google feed, the animation stutters like mad. It’s a bizarre thing to miss in QA on two successive phones. Huawei’s EMUI software layer used to be a complete deal-breaker for me, but Huawei really turned things around in Nougat. Oreo made a few more improvements, and I can use the P20 Pro without cursing the software on a daily basis. EMUI 8.1 still makes some silly mistakes, though. The changes in this version of EMUI compared to what shipped on the Mate 10 Pro appear limited. It’s mostly performance tweaks, a few new camera modes (see above), and Android’s neural network APIs. Apps can take advantage of the Kirin 970’s NPU via that API, but almost no one is bothering right now. The only integration at launch is a special version of Prisma that does photo processing locally instead of in the cloud. Huawei has thankfully moved beyond clunky and experience-damaging features like the timeline notification UI and aggressive background app management. The overall look and feel of EMUI is also better these days. However, Huawei still insists on making the lock screen almost useless. It only shows notifications once, so they vanish after you unlock the phone even if they’re still in the notification shade. Even when notifications do appear, you can’t expand them. It makes controlling media playback a serious pain. From what I understand, the regular P20 does allow expanded notifications. Perhaps this will be part of the final software build on the Pro. The overall aesthetic is starting to look a bit dated with the black/blue quick settings and squircle icons. It’s much better than the Marshmallow version of EMUI was, but the current software isn’t as clean or consistent as stock Android or even the Samsung Experience skin. I can live with it, but I don’t love it. I do appreciate the inclusion of a native dark theme in the settings, though. Huawei also has the floating nav button from the Mate 10 Pro here, but it’s bad and you should not use it. The home screen has Google Feed integration on the far left panel, but this didn’t work when I first got the phone. I was eventually able to get it working. I assume this won’t be an issue on retail devices. Huawei’s icon choices are baffling—its own apps are squircles, but other apps appear to default to round adaptive icons if they have them. Huawei also still uses a button for the app drawer rather than the increasingly popular swipe up. I suppose I should be thankful there’s an app drawer option at all. The default setting is to have all the apps jumbled on the home screen, which is just terrible. The Huawei search UI is accessible with a swipe down, but I don’t find this very useful, and I often trigger it when I don’t mean to. Again, the home screen isn’t my favorite, but I can live with it. Note how the night display indicator moves over to the notification area when there’s no more space on the right. You’re probably wondering how that screen notch affects the UI, and let me tell you, it’s weird. For all the notch hate out there, I can’t wait for Google to release Android P and say “this is how you do notches.” OEMs are doing dumb things right now, including Huawei. Your signal and Wifi are over on the left side of the notch, and the clock and other status icons (e.g. vibrate, battery, alarm) are on the right. Notification icons stack up on the left next to the signal, but you can only fit a few. Things get truly weird when your status icons on the right become too numerous to fit. Then, the phone moves some of them over to the left side with your notification icons. It’s a confusing mess. Huawei hasn’t gone out of its way to talk about it, but the P20 Pro also has the Easy Projection mode that debuted on the Mate 10 Pro. With a Type-C to HDMI cable (not included), you can get a desktop-like UI on a TV or monitor, or just mirror your phone interface. I didn’t think this feature would be advantageous when I first reviewed the Mate 10 Pro, but I’ve ended up using it several times, and it really came in handy. I also like Huawei’s app twin feature, which allows you to run multiple copies of an app with different accounts. Huawei also includes some bloatware apps in the form of its own unnecessary duplicate apps and third-party pre-loads. It’s not as egregious as the software loadout on carrier phones, but it’s a bit much for an expensive unlocked phone. Like the Mate 10, some Huawei apps are optimized for landscape orientation with multiple panes. I don’t find any of these apps particularly compelling, but you can disable them in settings. Overall, EMUI 8.1 on the P20 Pro is fine. I don’t love all the UI decisions, and the lock screen causes me physical pain. However, it has some cool added features like Easy Projection and app twin. The custom version of Prisma is also a cool demo of what you can do with the NPU and Android’s new APIs. Speaking of which, good on Huawei for getting the latest version of Android on this phone. I’m torn on the P20 Pro’s hardware. The Twilight colorway is so, so cool, but the mirror finish is slippery and quick to smudge. 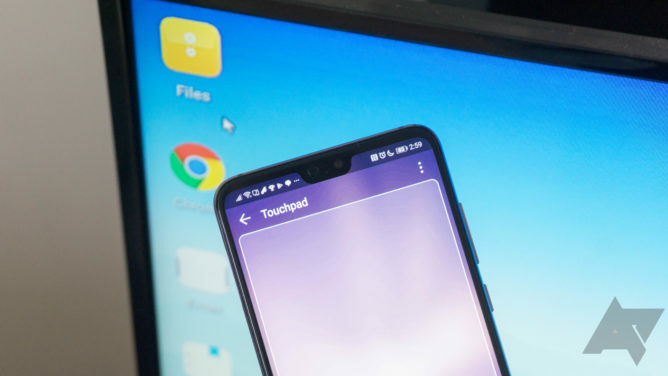 The OLED panel is sharp and has pleasing colors, but the notch feels unnecessary. The phone still has a chin with a (fast) fingerprint sensor, so why make the phone asymmetrical with a notch? 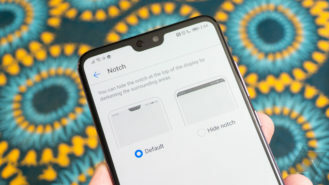 The way Huawei’s software handles the notch is also somewhat wonky. The software does wonky things in general, but it’s tolerable. EMUI has reached the point that I can cope with it even if I’d prefer to be using stock Android. The triple camera system is one of the main selling points of this phone, and it can do some very cool things. The 3x telephoto lens is useful, and it’s amazing that you can take a 40MP image with a phone. 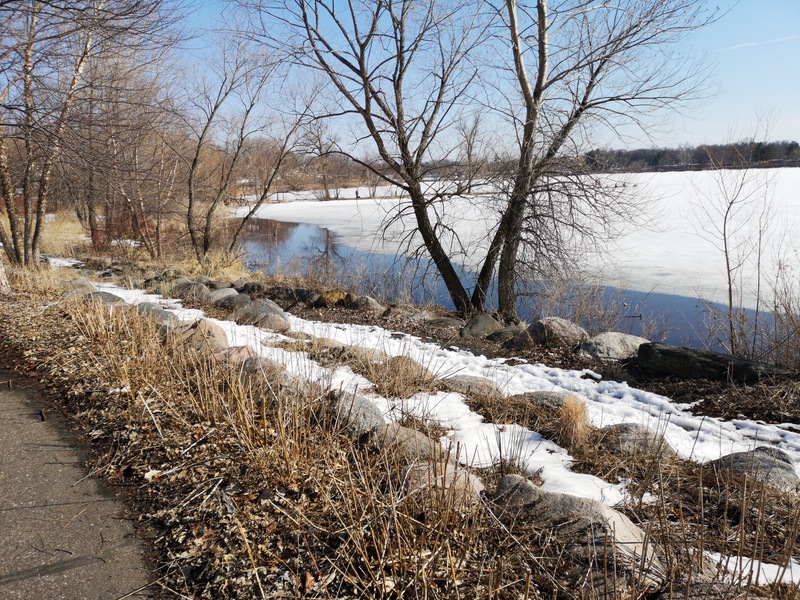 Although, the photos are better overall in 10MP mode with all the AI processing features and enhanced brightness. However, a lack of automatic HDR and some processing foibles leave the P20 Pro just shy of top-tier smartphone cameras. The Pixel is clearly better, and the Galaxy S9+ edges it out, I think. If I were going to buy a Huawei phone right now, it would not be the P20 Pro. It’s not a bad phone, but I don’t like it as much as the similarly specced Mate 10 Pro. It’s not remotely worth €900 (which works out to around $1,100) when you can get a Mate 10 pro for hundreds less.